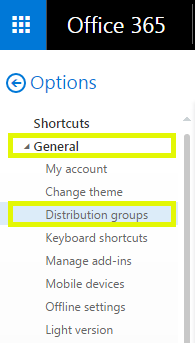 You can make changes to the distribution group or you can delete the distribution group altogether. You can add a new member, change ownership, change permissions, change the group name, delete the group altogether, and more. Note: You don't need to be an administrator to make changes to your distribution group, but there are some tasks that only admins can perform. For example, only admins can grant membership access to people outside your organization by creating them as shared contacts. See your admin for more information. To delete the distribution group, click Delete , and click Yes to confirm you want to delete the group. general Change the group name, alias, email address, and notes. ownership Add or remove group owners. Owners can make changes to the group. membership Add or remove group members. Members are the people who receive email sent to the group. By default, owners are added as members. membership approval Specify whether owner approval is required to join the group, and if members are allowed to leave the group. delivery management Specify who can send email messages to this group, both inside and outside your organization. message approval Approve whose messages need approval before being sent, and set up group moderators. 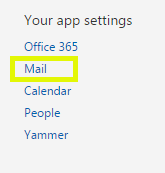 email options Admins (only) can include other email addresses where group members can receive the incoming mail. MailTip Create a MailTip that displays to anyone who sends email to the group email address.